Vancouver is the second most unaffordable housing market in the world after Hong Kong, according to a new study of major property markets. That could spell trouble for homeowners if mortgage rates rise, economists say. "Given how high house prices are relative to household incomes, you'd only have to see a moderate increase in mortgage rates to have a really huge hit to affordability," said David Madani, Canada economist at Capital Economics. The annual Demographia International Housing Affordability Survey ranks real estate markets in Canada, the United States, Australia, China, Ireland, Japan, New Zealand, Singapore and the United Kingdom. The survey calculates affordability by comparing median house prices with median incomes -- the higher home prices relative to incomes, the more unaffordable the market. Cities like Vancouver and Toronto, where house prices are significantly higher than incomes, would be hit hardest by a spike in mortgage interest rates, Madani said. Many homeowners could find themselves struggling to make monthly payments. In Vancouver, median home prices were 10.6 times higher than median incomes in 2014. That's the worst affordability ranking Vancouver has ever received in the survey's 11-year history, and an increase from 2013 when prices were about the 10.3 times higher than incomes. In Toronto, median home prices were about 6.5 times higher than median incomes last year. A report released Monday by TD Economics said even a mortgage increase of two percentage points could cause financial hardship among Greater Toronto Area homeowners, pushing up the number of residents who devote 30 per cent of their income to mortgage payments to 20 per cent from 16 per cent. 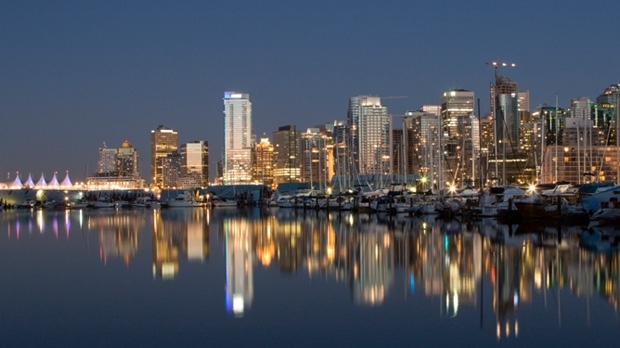 Although Vancouver was the only Canadian city that made it to the Top 10 list, housing markets in Toronto, as well as in Victoria, Kelowna and the Fraser Valley in B.C., were also ranked as unaffordable by the Demographia study. The report blames Ontario's urban containment policy, a development plan that strives to prevent urban sprawl, for Toronto's swelling home prices. Meanwhile, Moncton, N.B., was ranked Canada's most affordable market. Fredericton and Saint John, N.B., Windsor, Ont., and Charlottetown were also ranked as affordable places to buy homes. Overall, the study ranks Canada as "seriously unaffordable," with home prices in major urban markets about 4.3 times higher than incomes, while for Canadian real estate markets overall, median home prices are 3.9 times median incomes. The Bank of Canada had been expected to raise its trend-setting interest rate, which has been at one per cent for more than four years, this fall. Economists now say that's unlikely, given that the collapse in the price of oil is likely to stunt economic growth. However, Madani says even if the central bank remains in a "holding pattern," Canadian mortgage rates could rise in response to economic recovery south of the border and policy actions from the U.S. Federal Reserve. "We can expect the U.S. Federal Reserve to soon begin to raise interest rates, and with that we expect to see rising U.S. Treasury yields," Madani said. "On that basis, we have been expecting long-term interest rates in Canada to go up, and those rates are what really, in some sense, determine or influence mortgage rates.